I was gifted the Desire Map Day Planner in September 2014 and was so surprised when the package arrived at the tiny house. I loved using the 2014 planner and was going to buy the new model, so I felt extra grateful for the gift. "I'm going to say something a bit audacious and salesy-sounding. Here goes: The Evergreen Desire Map Day Planner could totally uplift your life. Because being mindful, reflective, honest, optimistic, on time, and at least a bit organized — is a daily deal. The inspired and “together” life you dream of has got to have practical applications. This is it. A Day Planner that incorporates your soul and your to-do list; your core desired feelings and your goals; your gratitude and your plans for change. This is the Evergreen version of The Desire Map Day Planner. Big open space for you to start setting up your daily intentions based on your truest desires. You fill in the dates, so you can start using this planner any time of the year, for 12 months of Desire!" 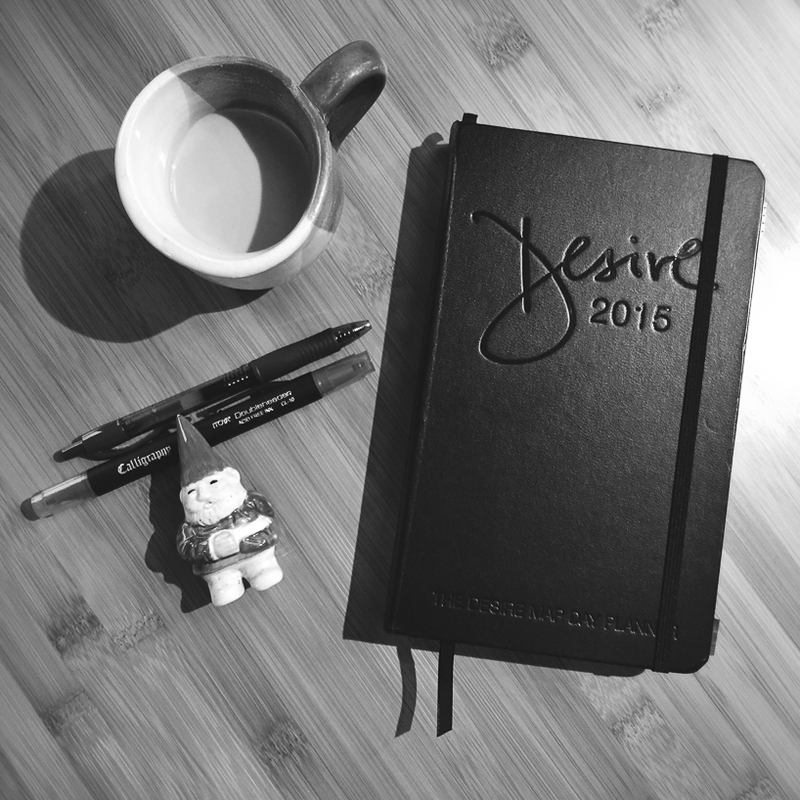 We are only a few weeks into 2015, and I wholeheartedly love the Desire Map Day Planner! It helps me take small action steps each day in every area of my life. Below is a brief overview of how I use my planner. I reflect on my core desired feelings (my theme for 2015 is gratitude). At the top of the page, I write down the three most important tasks that I need to accomplish. I don’t overthink what I’m going to write about in the planner. Instead, I focus on finding my flow, having fun, and letting go of perfection. I use the monthly spread as a general map for the month. For example, I'm working on a journaling class, and I want to have my first draft done by the end of the month. Looking at the month ahead keeps me focused and motivated to complete my tasks. The week-endreflection is helpful because I review the past week and get a better sense of what I accomplished. Last week, I felt like I hadn't done much because I was still feeling ill. However, I accomplished more than I realized, which surprised me because I was focused on self-care rather than working. Thankfully, I’m starting to get my energy back! There is also space in the planner for monthly reflections and a mid-year reflection. Reflective prompts are fantastic opportunities to renew my intentions and to make sure I’m on the right path. A few weeks ago, I was telling Logan about the planner and how I use it everyday. He thought the planner sounded helpful and was going to buy one, but it's out of stock and won’t be available until February. In the meantime, Logan has been writing his daily intentions in his Midori. After our conversation about the planner, Logan and I decided to share our daily intentions each morning. Sharing this information gives us a better sense of what is going on in our professional lives. Plus, our morning talks have led to interesting conversations about our careers, family, and where we see ourselves in the next five years. 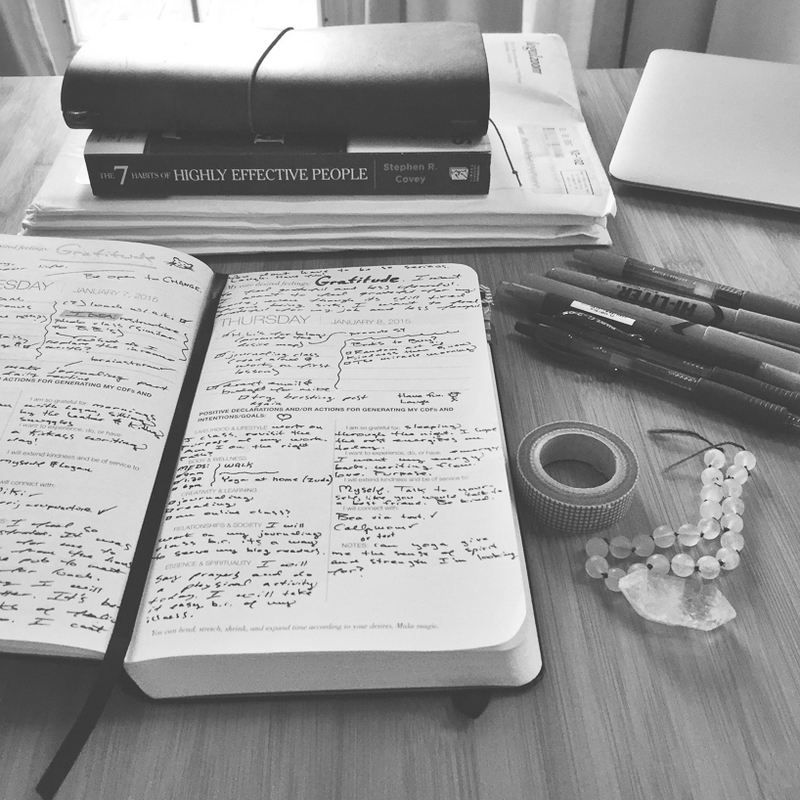 Do you use a daily planner? I'd love to hear how you plan your days in the comments section.